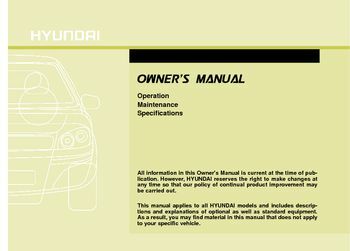 All information in this Owner’s Manual is current at the time of publication, any time so that our policy of continual product improvement may, this manual applies to all HYUNDAI models and includes descriptions and explanations of optional as well standard equipment, cAUTION: MODIFICATIONS TO YOUR HYUNDAI, your HYUNDAI should not be modified in any way. The performance, safety or durability of your HYUNDAI and may, in addition, violate conditions of the limited warranties covering the vehicle, tWO-WAY RADIO OR CELLULAR TELEPHONE INSTALLATION, your vehicle is equipped with electronic fuel injection and other electronic components, possible for an improperly installed/adjusted two-way radio or cellular telephone adversely, manufacturer’s instructions or consult your HYUNDAI dealer precautionary measures. Special instructions if you choose to install one these devices, sAFETY AND VEHICLE DAMAGE WARNING, this manual includes information titled as WARNING, CAUTION NOTICE, this indicates that a condition may result in harm, serious injury death you, or other persons if the warning is not heeded.